Researchers at Queen’s have developed a highly innovative new enzyme biomarker test that has the potential to indicate diseases and bacterial contamination saving time, money and possibly lives. The test, developed by scientists at the Institute for Global Food Security (IGFS) at Queen’s, can detect enzyme markers of disease known as proteases in humans, animals and food products. Levels of these enzyme markers can be highly elevated in the urine of patients with diabetic kidney disease, or at the sites of infected wounds. Similarly, in cows, an elevation of proteases in their milk can reveal diseases such as bovine mastitis, a type of mammary gland infection. In food, proteases produced by bacteria contaminated in meat and dairy products can lead to rancidity, as well as decreased shelf life and quality. Current protease detection methods are costly, time-consuming and are not always effective. Scientists at the IGFS have developed a nanosensor which has resulted in sensitive, fast and cost-effective protease detection in milk and urine. Dr Claire McVey, Queen’s researcher and co-author on the study published in leading journal Nano Research, explained: “Not only is the test cheap to produce, but it can be used anywhere and is not reliant on laboratory conditions. The approach developed by the Queen’s researchers was tested on milk and urine but it could be adapted for a number of other applications. Dr Cao explained: “Using molecules other than casein to coat the surface has the potential to detect other types of enzyme biomarkers. 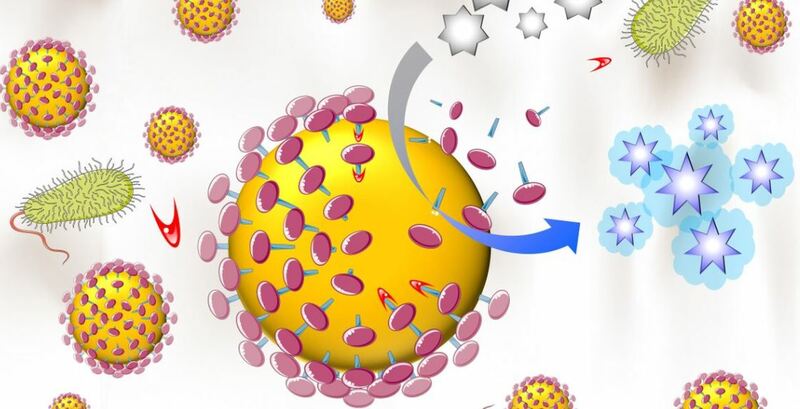 For example, coating the nanoparticles with lipids could detect the lipase enzyme, which could help in the diagnosis of diseases such as pancreatitis. “Following full validation of this test, we would like to explore how we could expand the application to detect a host of other diseases or contaminated foods. “This new approach will enable the identification of enzyme biomarkers at the point of care. It could change the landscape of how enzyme biomarkers are detected and diagnosed, making an impact not only on food safety, but on the diagnosis of enzyme-related illnesses among animals and humans. Professor Chris Elliott, founder of the Institute for Global Food Security and a co-investigator in the study commented: “The ability to diagnose disease or contamination quickly can have a huge impact on how serious problems can be dealt with. To find out more about supporting health-related research at Queen’s visit the Development and Alumni Relations Office website or contact Teresa Sloan, Head of Health Fundraising, telephone +44 (0)28 9097 5394. Medical queries arising out of this news story should be discussed with your GP/consultant and not DARO staff.